Have you ever been in the stretching area of your local Anytime and noticed a circular piece of foam just sitting there? We have too! You don’t have to spend thousands of dollars with your local massage therapist to get a good deep tissue treatment. Today, we dig into what a foam roller is, how to use it, and why it’s beneficial for your workout routine! Foam rolling is a self-myofascial (http://en.wikipedia.org/wiki/Myofascial_release) release technique used to alleviate muscle pain and increase blood flow. It uses body weight to generate direct pressure to the “knots” or trigger points in the body. Often thought of as an “athlete’s only” piece of equipment, the foam roller is a great tool for anyone needing to release muscle tension (and we ALL have a bit of muscle tension from sitting too long, exercise, or general tension). Imagine using a rolling pin to roll out lumps in bread dough and you’ll get the picture. The roller is a foam cylinder and it comes in a variety of sizes. Most commonly in the gym setting, you’ll see a longer roller, measuring 36 inches with a 6-inch diameter. The density of the foam can vary as well. If you’re new to foam rolling or have particularly tight muscles or trigger points, opt for a softer foam roll. Typically, white rollers are softer, while blue or black rollers tend to be firmer. Rolling can be effective for many muscles, including calves, hamstrings, glutes, quadriceps, hip flexors, latissimus dorsi (http://en.wikipedia.org/wiki/Latissimusdorsimuscle), and the thoracic spine (http://en.wikipedia.org/wiki/Thoracic_spine). 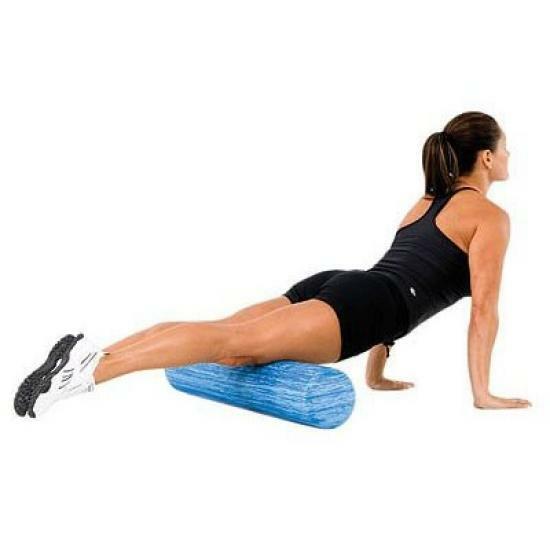 Place the foam roller under each muscle group and roll, long strokes, for 60 seconds until a tender area is found. Once a knot is found, maintain pressure on the knot or trigger point for 30 to 60 seconds by moving back and forth over that surface area. Follow up by performing a stretch for each muscle group you just have rolled for maximal benefit. Try these simple foam roller exercises and stretches to target areas where most everyone could use a little love: the upper back, glutes, and thighs. Begin with the foam roller underneath your shoulder blades. Place the hands behind the head for support, or cross the arms over the chest. Lift the hips up slightly off the ground, maintain a slight curve in the low back (almost like you are performing a small crunch). Use your feet to push forwards and backwards to roll out the upper back, rolling from the shoulder blades to the mid-back. Begin on hands and knees with back in a neutral position. Inhale and lift the chin and tailbone towards the sky, creating an arch in the back. Exhale and tuck the chin and tailbone towards the ground, rounding out the spine. Begin by sitting on the foam roller, knees bent and feet on the ground. Shift slightly to the right and begin to roll up and down the length of the glute. Switch sides. Lie on your back and draw both knees into the chest. Begin with the foam roller underneath the quadriceps (fronts of the thighs). Lift the legs slightly off the ground and place the weight of the upper body on the forearms. Push with your arms to roll out the quadriceps by moving forward and backwards from pelvic bone to the knee. Stand on the left leg and bring the right foot towards the glutes. With the right hand, grab onto the right foot, keeping the knee pointed towards the ground and legs close together.